Rubyellen and I are happy to have Danielle Thompson joining us for this week's Vintage Mama feature! Danielle's love for vintage is evident in the way she's decorated her home, in the digital designs she creates, and in her fantastically fun wardrobe. She's a mother to two boys and doesn't let the challenge of finding great vintage for boys stop her from dressing them in equally fun clothes. I started wearing vintage in High School when I first started to truly develop my own sense of style. I shopped at thrift stores around Memphis with my friends and it was such an eye-opening experience for me. I felt liberated that I was finally dressing in a way that reflected my true self. Not to mention it was cheap! Then I went to college in Alabama and continued to create my wardrobe through thrift stores. It wasn't until I got married, graduated college and had "real jobs" that I started to abandon thrift store shopping. I'm not sure if it was because I finally had money of my own (to buy new clothes) or that the thrift-store wardrobe didn't feel "appropriate" for my graphic design jobs, of which many were in a corporate atmosphere (say it with me, yuck). After I started having babies, I naturally started to gain weight and I just felt frustrated finding clothing that fit my new figure, style and personality. I didn't have a lot of time to scour local stores for good-fitting vintage because, well, I had kids now! Who has time, right? It wasn't until a couple years ago that I started to shop vintage online. I didn't have to spend possibly hours driving around Atlanta, going to different stores and possibly coming home empty handed. Shopping online made so much more sense to me. But honestly, I didn't shop efficiently at first, not even taking my measurements (I know) and just going by the S, M, or L sizing and often failing miserably when I tried on the pieces at home. I finally took my measurements (yay!) and started having better luck. I HAVE found more time to shop locally as well (which is much easier because you can try things on right there before you buy it) so that has been fun, too. 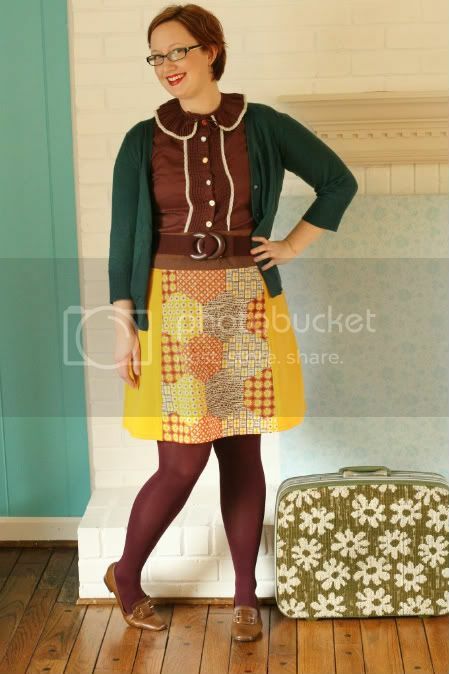 It has been so inspiring getting back into vintage clothing after a hiatus. I felt like I had given up because of the new challenges with my fuller figure, post-pregnancies. I've now figured out how to work with my curves, but still wear clothing that reflects my true style. I truly feel that no matter how you feel about your figure ("I'll buy new clothes once I've lost weight! "), you should embrace *you* no matter what size you are. There's vintage clothing out there for all sizes. Don't put it off like I did for so long. Q: How do you style your sons? If I'm being honest, I don't outfit my boys in a wardrobe full of vintage pieces every day. Number One, it's challenging to find really great vintage for boys (but I do find some great stuff on Etsy vintage!) and Number Two, my oldest (7) is not so into wearing vintage. 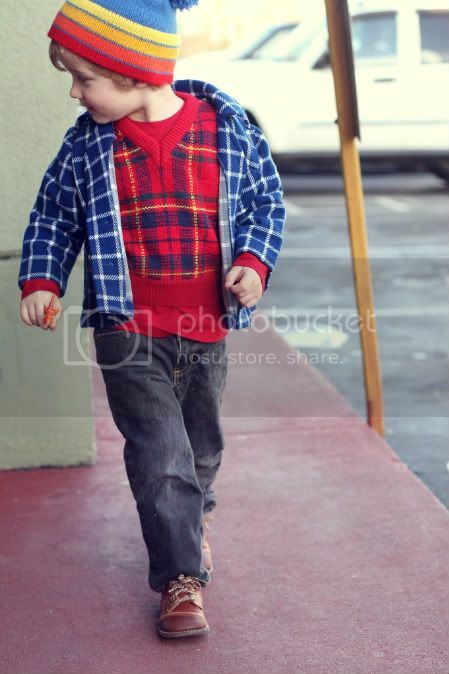 Although I have to say, that he does entertain his crazy mom and dons some vintage for photos sometimes. The kids in the area we live generally dress pretty conservatively. 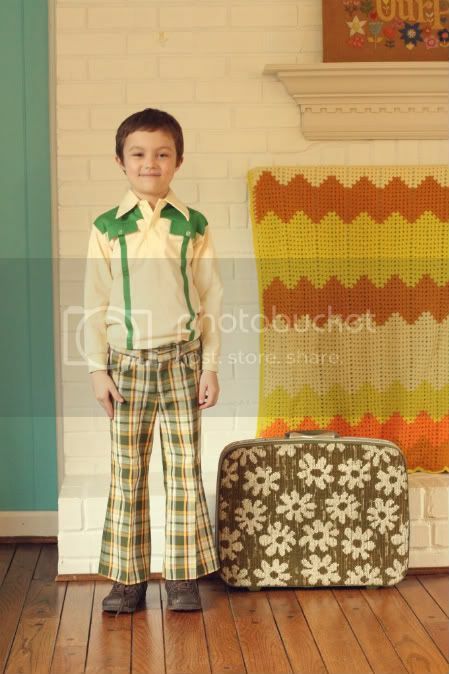 I think if we lived in a really cool/hip area, I would try harder to dress the boys in vintage. 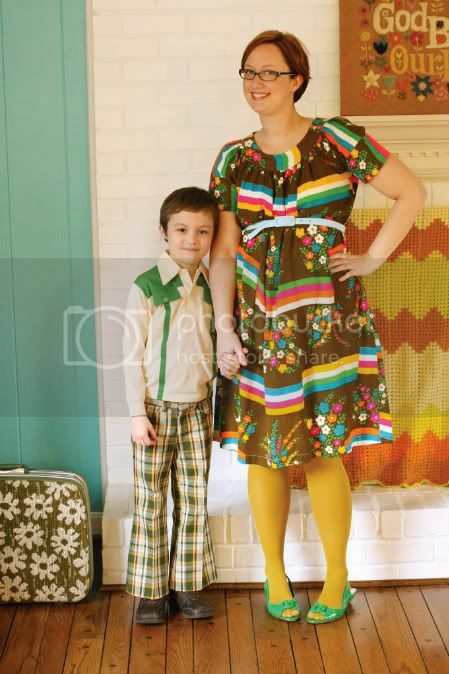 But I don't want to be one of those Moms that projects her own style onto her kids. The youngest (3.5) is still at an age where he has absolutely no opinion about what he wears. He's totally go-with-the-flow, so I'm taking advantage of it while I can! 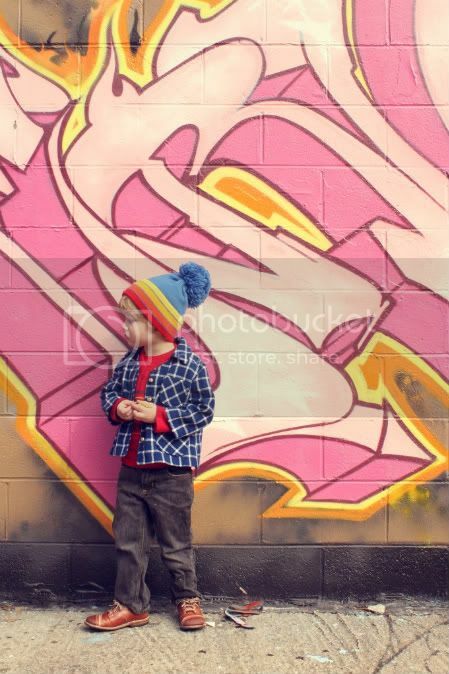 He has worn some vintage finds multiple times to his preschool and the teachers have been quite impressed. ; ) The outfit he's wearing in these photos, he actually really loved, and I couldn't get him to take off that jacket! (happy Mom!) He also really loves wearing those vintage shoes I found on Etsy. 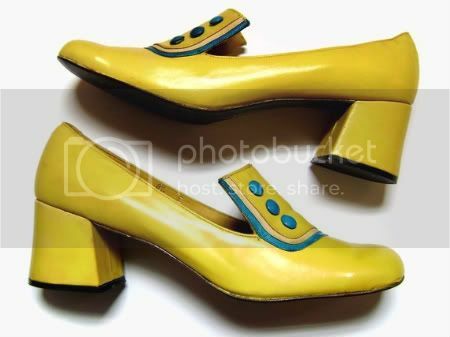 They are amazing finds and were in never worn condition. He does wear mostly hand-me-downs from Cooper though. Those pretty much round out his wardrobe. I generally look for specific decades that I love, the 60's and 70's being my favorites. I love the mod styles of the 60's and the styles of the 70's generally have very flattering shapes (which is so important). I think the 70's styles fit a broader range of figures. I also look for colors and patterns that I love. Mixing patterns is one of my favorite things to do when assembling outfits. I have several that I unfortunately don't have photos of, but I do love this calico puffy patchwork purse that I found at an antique mall. 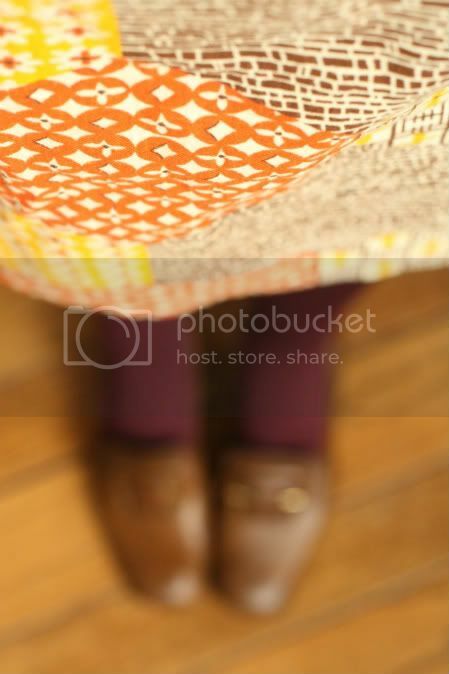 I'm very into the calico patterns and colors from the 70's right now.. lots of mustard yellows, tomato reds, etc. Q: Do you have one piece that got away, whether it was sold before you could snag it or would've broken the bank? My friend Jenny from frecklewonder recently posted about these shoes this week and my jaw dropped to the floor when I saw that they were my size and pretty much the most perfect shoes I'd ever laid eyes on. But alas, I saw the blasted "RESERVED" in the listing title and my heart sank. Vintage goodies you're currently coveting: I'm currently trying to spend/shop less, but I would love this for Campbell, and I'd love this for myself. On the handmade front, i REALLY want to make one of these for Campbell! (and for myself for that matter!) This has been on my to-do list for a while. 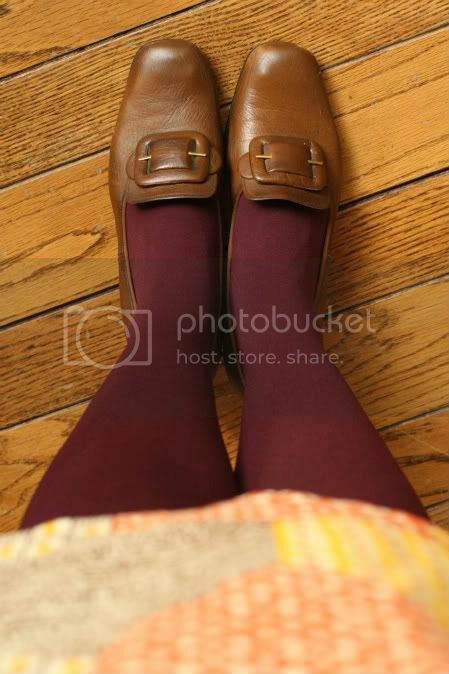 Thank you, Danielle, for such a beautiful set of photos and for sharing your style with us! I love seeing what you put on your boys as well as your eye for color and how fun and beautiful all of your outfits are! 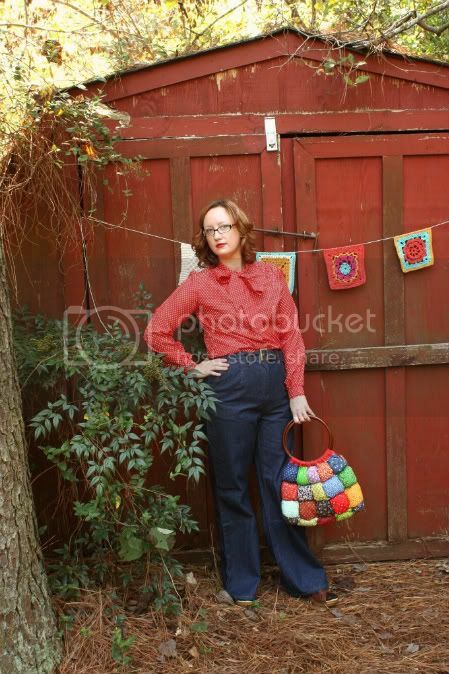 Thanks for sharing your Vintage Mama style with our readers. OMG she looks amazing and her sons are sooo rockin those styles! I love it! WOW her dresses are just gorgeous. I don't dress in bold and bright prints and colours myself- although my dress sense has been known to look a little wacky... - but I have friends that do and i'm always inspired by their outfits. And her son looks so lovely! If I have a child I am going to dress him/her like that! I love Danielle's blog too, it is so FUN to see that much color--totally brightens my day. very cute! i love that her little boy is dressed in vintage too! love all the super fun colors and prints, danielle looks GREAT!!!! love, love, love all the colors...and prints! thanks for sharing! 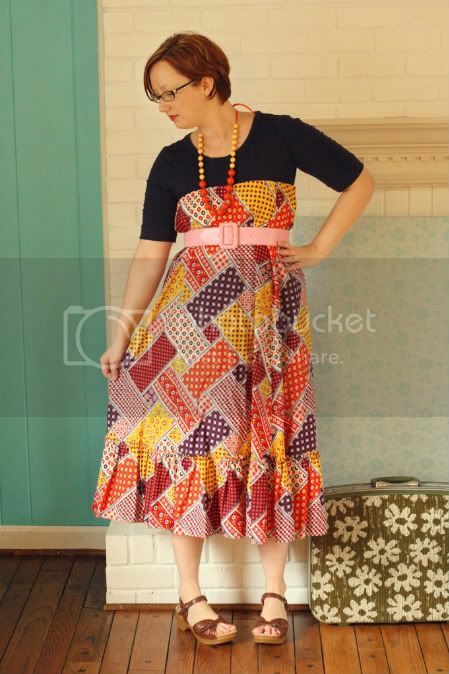 Her dresses and skirts are amazing!and I love that purse! Her boys are adorable! It is so hard to find anything for boys! She looks absolutely beautiful! I love what she said about being supportive of what makes her son happy (sports) even though it's not her thing. I think that is the best thing a mama can do! Love this post! that polkadotted blouse and jeans must come and live with me!!! i ADORE danielle -- truly my design heroine. i love her style and am a huge fan of KD. thanks for sharing this lovely interview! I know, she is fantastic! I love her sense of style and how she gives 100% to everything she does!